Everyone is international these days mostly due to social networking and interaction. Global interaction is ideal when we’re looking to connect and share generic content. However, many users need to share and recommend locally in order to effect their lives. Sunlize is a local headline sharing website. 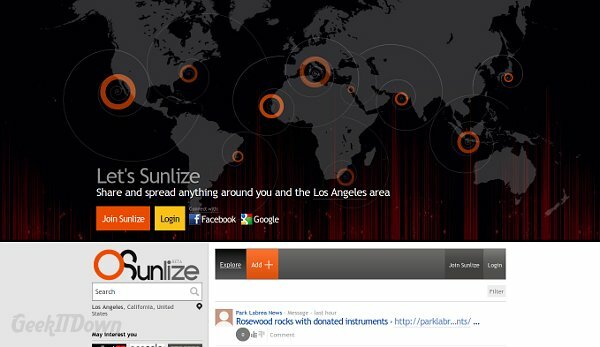 Sunlize acts as a gathering place for local headlines and news stories or interest pieces in a local community. Stories and articles are linked from a variety of sources including local newspapers, magazines, bulletins and wherever else users find local information. Sharing involves comments, Facebook and Google shares, thumbs up and thumbs down on the article postings. If you’re familiar with Headslinger or the new Pulse web app option, then you may grasp the functionality of Sunlize a bit more easily. The aggregation is accomplished by using a visitor’s IP address to approximate their location and deliver relevant articles to the frontpage. Sunlize is great if you want to know what’s happening in your area and filter out all the global news and headlines. Using Sunlize means users can get the information they’re immediately after without having to filter results or sorts stories by entering in location details. Visitors can also change locations to follow stories happening in other localities, whether they be nearby to their own location or across the country. It’s a convenient way to check on your hometown or potential vacation destination prior to visiting. Sunlize is awkward to get a handle on at first. Without taking a few moments, it’s hard to understand just what they’re offering. Once you do however, it’s easy to see why users keep coming back. The information is current and because it’s local, is very relevant to Sunlize visitors. The interface is a bit annoying with most content pushed below the fold, but some simple scrolling fixes that. Ideally, Sunlize could benefit from some website tweaks and perhaps a walk-through type instruction page or video to help new users find their way around. Additionally, a source page would be a fantastic way for users to choose which stories they see rather than a summary list from all sources. Sunlize has a bunch of promise and we look forward to seeing how they improve as they come out of beta.